GoodDayRome is now Girovaga. About time since we left Roma over a year ago. Girovaga is an Italian adjective, feminine form, meaning wandering. It can also be a noun meaning itinerant or wanderer. In its verb form, girovagare, the meaning is “to wander about.” That, hopefully, is fitting. All of the old posts, beginning in May 2012, are preserved so our five years of Italian living and traveling are documented. In the year since we returned to the U.S., I have blogged occasionally about life here as well as some of our travels, and that is what I will continue to do. Some posts will be whatever crosses my mind. Others will be about travels near-and-far. If you are a subscriber to GoodDayRome, my new posts will still hit your mailbox but with the Girovaga title. I hope you’ll keep on reading along and sending me your comments. I am frequently asked for ideas on what to do in Roma. After all, we have people house-and-cat-sitting all the time, often for 2 or 3 weeks. And living here, we certainly have to get beyond the usual suspects. Embedded in the steps of the Great Hall of Galleria Colonna, this cannon ball dates back to the Risorgimento. Everyone knows the Colosseum and Vatican, and probably the Galleria Borghese. While these should not be missed, there are many other lesser-known sights to consider. You might also enjoy reading my blog on the subject of off-the-beaten-track ideas. From April-November 12, 2017, there are once again special events in the Forums, a guided walk through Caesar’s Forum at night, and a multi-media show in the Forum of Augustus. You can find info at Viaggio nei fori. There’s nothing like a lovely outing after dark on a warm summer night. Take a break during the heat and head out after an early dinner for these events. I would do both, if not necessarily on the same night. If you have trouble reserving online, do not hesitate to call. They speak English. Domus Romane at Palazzo Valentini is not the usual Roman ruin. Everyone we send here says it is one of the best things they did in Roma. Beneath a government building in the center of Roma, just off Piazza Venezia, are the excavated ruins of a Roman palazzo. You walk across a Plexiglas floor to view them, enhanced with a multimedia presentation to illustrate what things looked like 2000 years ago. Only three English tours daily so be sure to reserve online in advance. Hard-hat tour of Nero’s “Golden House,” the Domus Aurea. Domus Aurea, Nero’s Golden Palace. Who can resist? It is legendary, although the goldenness is long gone. The restoration project is ambitious given the size. Visit the website and click on “Opening Hours.” Be aware, it is cold underground and even in summer you’ll need a jacket! We went to Villa Torlonia a couple of years ago on a sunny February Sunday and enjoyed it very much. Recent guests told us that more has been done and one can even visit Mussolini’s bunker from WWII. The entrance fee to see all of the buildings is a little expensive, IMHO, but worth seeing for architecture buffs. La Casina della Civette is quite unique. The Mussolini Bunker is priced separately from the main buildings. La Casina delle Civette at Villa Torlonia, a curious mix of styles. Galleria Colonna is only open on Saturday mornings with an English tour at noon. We went early and had a wander around, then took the tour. Lovely private collection in an amazing building. The Colonnas are an ancient Roman family and members still live in the palazzo in private apartments. We have not been to the Princess’ Apartments, but British friends said they were great, so we need to go back. Palazzo Farnese, the French Embassy to Italy. This is an historic building with Michelangelo’s art and frescoes worth straining your neck to see. English tours only on Wednesday at 17:00 and you must reserve a few weeks in advance for security reasons. Niobe suffers from hubris and loses al of her children. Gardens of Villa Medici. Villa Medici, the French Art Academy in Roma. Open Tue-Sun with English tours three times each day. You will see what the gardens of a Renaissance Roman villa night have looked like. The Palazzo delle Esposizioni has special art exhibits that are usually worthwhile. Recently we saw French Impressionists from the Phillips Collection in Washington, D.C. Very busy Sundays when Roman families seem to flock to museums. Palazzo Braschi Museo di Roma near Piazza Navona is an under-visited, very tranquil museum. Cool on a warm day and certainly a respite from the rain should that occur. Featuring art depicting Roma in days gone by. The massive staircase at Palazzo Braschi is like an Escher painting. Galleria Doria Pamphilj in the historic center is also under-appreciated. It is yet another private collection in the old family digs. The collection includes Bernini, Caravaggio, Tiziano, Raffaello, and several Flemish Old Masters. The audio guide is excellent. The Quirinale, the President’s Palace. Only recently opened for regular tours, thanks to President Sergio Matterella. Previously it was the Papal Palace (pre-Vatican days) and also housed four kings of Italy. Like visiting the White House, but security is less stringent and it’s fancier. Riding the moving ramp down at Eataly. This is a huge place, built in what was an abandoned air terminal. Eataly has two locations, a small one in Piazza della Repubblica, and the Mother Ship near Stazione Ostiense. I believe the larger store is worth the trip. Easy to stop on your way home from Ostia Antica (see below) with many choices for lunch. Eataly features Italian-made food products and a few non-food items. It is a showcase for all good things in the Italian food culture. Getting there once you reach Stazione Ostiense is a bit interesting, as I mentioned in my blog. You must persevere! Looking to leave the crowds behind? Villa Farnesina is hidden away in Trastevere. Commissioned during the Renaissance by Agostino Chigi, a Sienese banker, it contains frescoes by Raphael and is lightly attended. Churches worth seeing: Santa Maria Sopra Minerva, St. Ignazio, San Clemente (the famous layered church), San Giovanni in Laterano, St. Paul’s Outside the Walls, Santa Maria Maggiore, Santa Prassede, San Luigi dei Francesi (the seat of the French Catholic Church in Rome) and others too numerous to mention. Bernini’s elephant obelisk, Santa Maria Sopra Minerva. There are two places we highly recommend guided tours: The Vatican and The Colosseo/Foro Romano/Palatino. Walks of Italy does a special tour of the Vatican Museums and St. Peter’s, “The Pristine Sistine.” I highly recommend it. It is not inexpensive, but the groups are small (only 12 people), the guides are educational and entertaining, and you get to the Sistine Chapel before it is a hot mess of people. For the sites of Ancient Rome, the Colosseo/Foro Romano/Palatino, a private guide is a great idea. For about €50-55 per hour, you get a personalized experience. Sonia Tavoletta (soniatavoletta63@gmail.com) and Francesca Caruso (francescainroma@gmail.com) are excellent. They will customize anything you want. If you have four-or-more people in your party, this is less expensive on a per person basis than many organized tours. Ostia Antica. In the “Piazzale delle Corporazioni” or Square of the Guilds. Mosaics depict services and products. Ostia Antica is less than an hour away from Roma by local train out of Stazione Ostiense. What the volcano did at Pompeii, time and the river did to Ostia Antica. These are actually well-preserved for Roman ruins, and I find the Rick Steves’ audio guide (MP3 available at his website) and the guide in his book are excellent for self-touring. Orvieto is a one-hour train ride from Roma Stazione Termini and a fascinating Umbrian hill town. 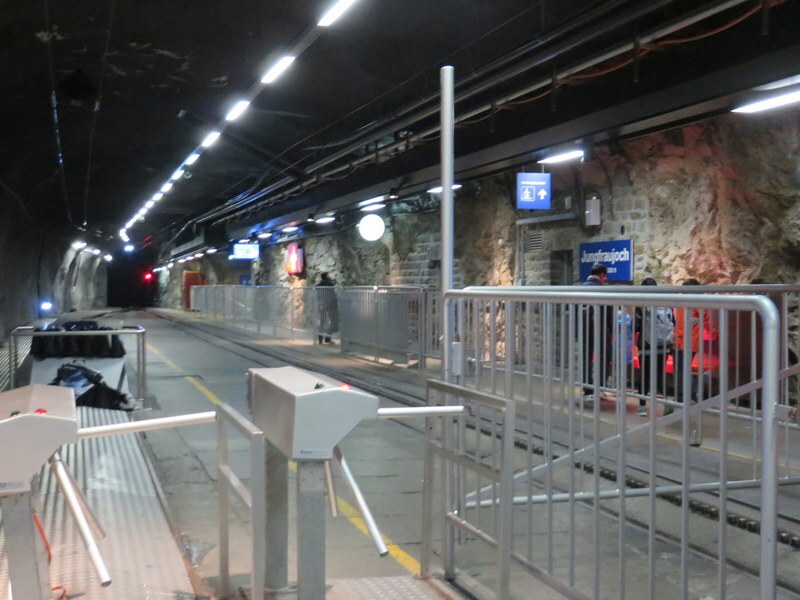 There is a nifty funicular that glides up from the train station to the plateau. Great place to wander, see the Duomo, have lunch, shop a little. Again, I have to turn to Rick Steves and encourage you to consult his guide to make good use of your time. The underground tour is worthwhile! Fountains and pools of Villa d’Este, beautiful during the day, take on added drama at night. Tivoli is about an hour by train from Stazione Tiburtina and an excellent trip any time of the year. We’ve gone in August for the evening light displays at Villa d’Este, which makes a wonderful one-night trip (see my prior post here). We’ve gone to Villa d’Este in September and April as well, and to Hadrian’s Villa (Villa Adriano) in May one year. Villa d’Este is easily done by train, but I would suggest having a car to try to go to Villa Adriano. Alternatively, take a bus tour from Roma. (Haven’t done this myself but there are options through many tour companies if you care to research it.) I think Villa Adriano would be best with a guide. It’s vast and a bit confusing. Formal gardens, Albano Laziale, papal estate. Castel Gandolfo and the Papal Palace. The Apostolic Palace is where the popes up until Papa Francesco went to relax and escape the heat of Roma. Papa F doesn’t relax and eschews the trappings of papal wealth. Bravo! Thus, one can visit the palace almost any old time. Castel Gandolfo is a lovely little town with good restaurants in addition to the fantastic Papal Palace. It would be hard to combine with my next suggestion because the gardens one visits in the Vatican by Train tour are actually in neighboring Albano Laziale, but if you enlist a taxi and make lunch a quick panino you just might manage to do both in a day. The Vatican by Train is an all-day event. You start with about 90 minutes to tour the Vatican Museums. (It is not enough time for the entire museum so you must pick a facet, a corner, and see what you can. We chose the Pinacoteca, which we had to ourselves for most of an hour.) Then you have a walking tour of the Vatican Gardens, which leads you to the San Pietro train station where you catch your private train to Albano Laziale and a tour of the papal estate there. You ride a train through these gardens as well. An audio guide is provided. There are many other possibilities: Sperlonga for the beach, Frascati just because (porchetta and local Frascati wine), Tarquinia for the Etruscan museum and tombs (stunning!)…. 10 Things you can do for Free in Rome from Italy magazine. Coop Culture is the official ticket site for many Italian sites. Check them before using a consolidator, who will add on fees. If you are going to the Colosseo without a guided tour, get your skip-the-line tickets from Coop Culture. The Roma Pass can be worthwhile if you do the Colosseo, et.al., one day and the Galleria Borghese the next, making those your first two entries with the pass. Otherwise, forget it. Transportation tickets/passes. You can buy tickets for single trips for €1.50 at any edicola (newsstand) or tabaccheria (tobacconist). There are also passes for 24, 48 and 72 hours at €7.00, €12.50, and €18.00 respectively, which are usually available at the edicola or tabaccheria. A 7-day pass is €24.00. Details at ATAC.com. Note that few buses sell tickets on board. Buy before you board and validate or risk a huge fine. Transit Trip Planning is available here. If you are traveling with a smartphone, download ProBus, AutoBusRoma, or Moovit. You can research bus routes and get an estimate on when the next bus will arrive. The books 24 Great Walks of Rome, Rome the Second Time, and 111 Things to Do in Rome are great for inspiration! I found all of them either at Amazon.com or Powells.com. Movies in English are shown every week. Usually, they are posted on Friday for movies from Saturday through the following Wednesday. Check here for what’s on. Some of the theatres do not sell popcorn or anything else to eat or drink, so eat before you go. If you have a favorite place I haven’t mentioned, please leave a comment. 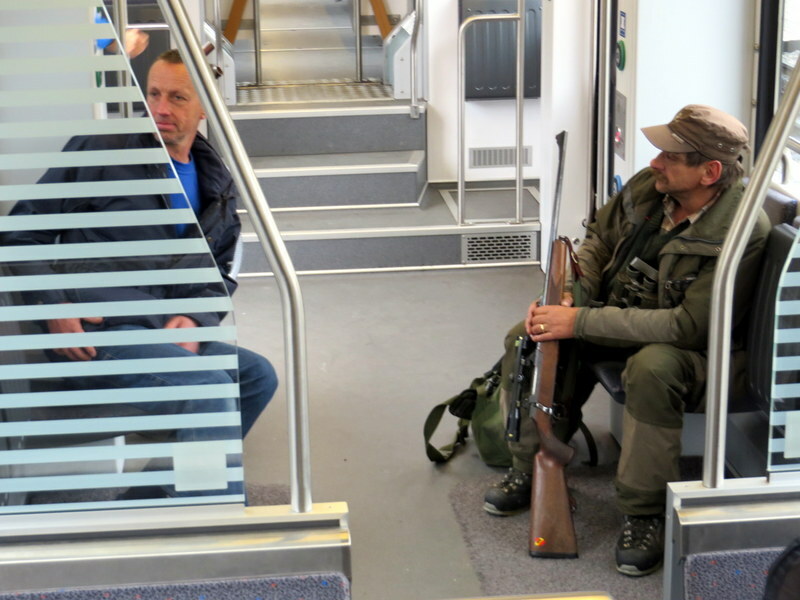 A man gets on the train carrying a gun. What would you do? If I was in France, Spain, Great Britain or the USA, I would dive for cover. But we are in Switzerland, in the Bernese Oberland to be precise, and apparently, no one bats an eye. Neither did we since he walked in accompanied by another local, and even women pushing babies in strollers were undisturbed by the sight. I am not going to pretend I understand the Swiss mindset or even the laws around firearms. This article from Time magazine on the subject is pretty interesting. I am not sure I am more concerned about the fact he was hunting in an area where people hike or carrying a weapon in public. When we saw this guy get on we got the giggles. Can you imagine if this happened on MAX in Portland? This was on the Wengeralp narrow-gauge cog railway. Switzerland seems to have its act together. The Swiss have managed to remain neutral in world politics, insulated from European Union issues as they are non-EU, but they take advantage of the Schengen Agreement and the abolishment of internal borders. Still, immigration is highly controlled. They have an admirable environmental record, plenty of water resources, clean air, excellent recycling, a thriving economy with low unemployment. Their public debt is less than 35% of GDP (compared to Italy at 134% and the USA at about 71%). And of course there’s the cheese. High prices do not seem to deter tourists, especially the Japanese who are here in droves and show no reluctance to shell out hundreds of Swiss Francs to see the sights and buy winter fashions. You would not believe the price of a Patagonia jacket here. 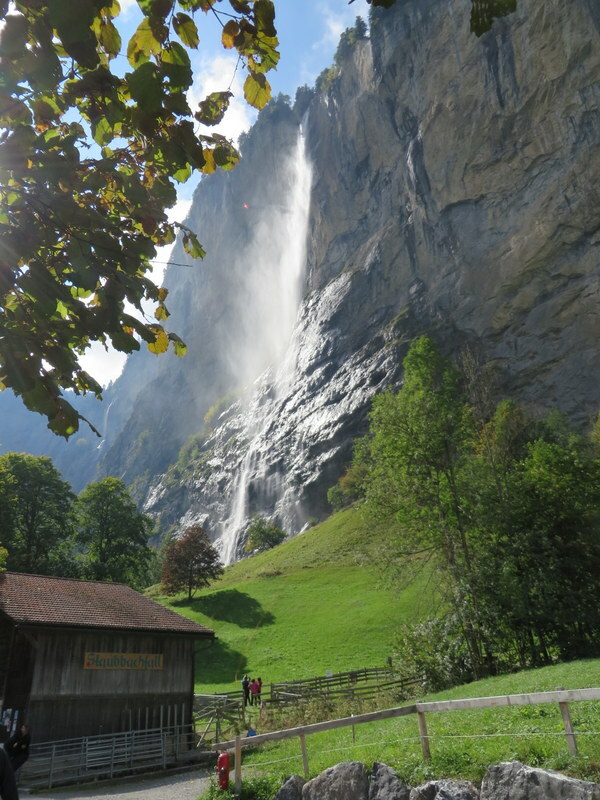 Staubbach Falls, visible from our vacation rental. This is our third trip to Switzerland in less than 2 years. Yes, we like it. The food is not as good as Italy, and the coffee almost all comes from a ubiquitous push-button machine found in virtually every café and restaurant. It’s CHF 4.00 for a basic cup of coffee or a single shot of espresso. In fact, everything is quite expensive. While the exchange rate is almost on par with the U.S. dollar, the actual prices are high. A pizza that would cost us about $11.00-12.00 in Italy is about $23.00 here. A small green salad runs $8.50. Wine by the bottle is insanely expensive in restaurants, but one can get a small glass of good local wine for a price less than we experienced in Seattle, Portland, and San Francisco. Why do we come back if it costs so much? The transportation system, the hiking, the natural beauty: Switzerland offers a lot of what we like to do when traveling. And it works, well, like a clock. 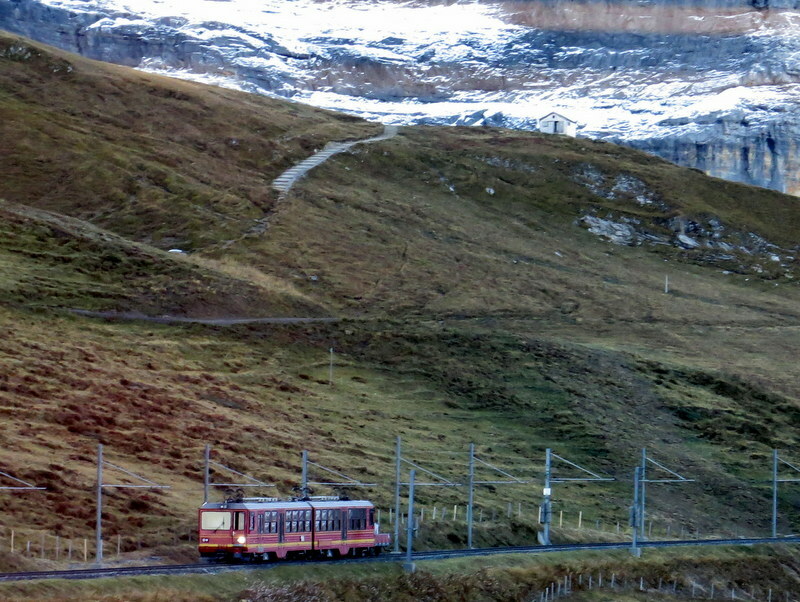 A Jungfraujoch train moves up the mountain. Most of the journey is in a tunnel inside the Eiger and the Mönch. I have wanted to go to the Jungfraujoch since Matt Lauer went there in 2011 during his annual “Where in the World is Matt Lauer” tour. During our first two Swiss trips in January 2014 and August 2014, we dismissed the trip to the Jungfraujoch as too expensive. 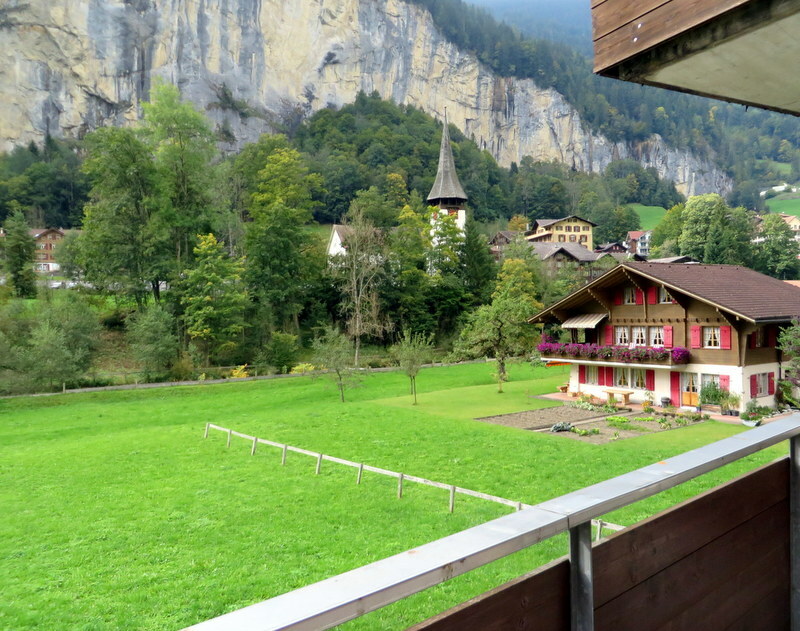 It costs CHF 204.40 per person from Lauterbrunnen in the valley to the Jungfraujoch and back. We learned that with certain types of passes one could pay less, so we vowed “the next time” we would make the trip. 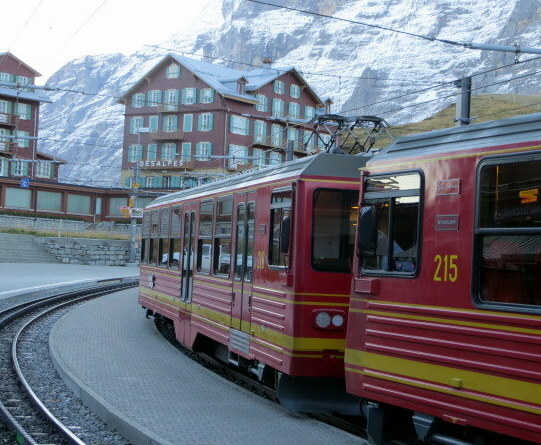 This is the next time, so we bought both half-fare Swiss passes and a Bernese Oberland Regional Pass. We had to pay a relatively small supplement to go all the way to the Top of Europe (called so because it is the highest train station in Europe). It was worth it! Jungfraujoch Railroad – our train ready to depart. Rising at 5:00 AM, we caught the first train up the mountain, in total about 1 hour 45 minutes from the bottom of the valley to the Jungfraujoch, arriving just before 9:00 AM. Some of the “tour” is goofy. The giant snowglobe in the Alpine Sensation was unrefined, and the Ice Palace sculptures were not nearly as nice as those at the Saint Paul Winter Carnival of my youth, but the pure beauty of the pristine mountain was the star, and contemplating the building of such a railroad in the 1890s sobering. Thanks to 100 Italian laborers, the tunnel was built. 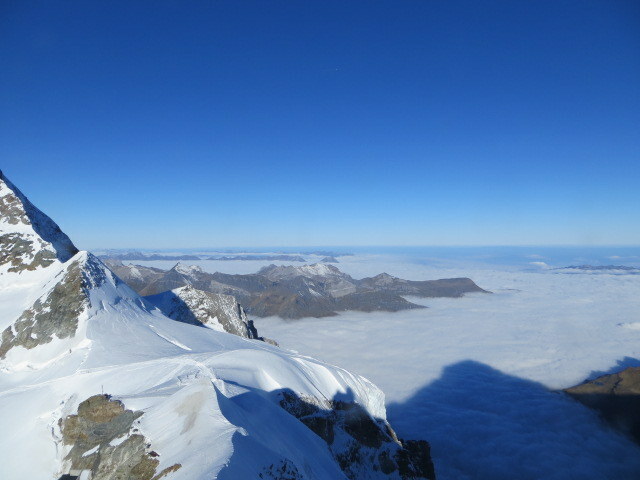 View from the Top of Europe over the cloud-covered valley. It was very cold outside! We went outside on the observation platform, but the 33 kph winds combined with the -1.5 Celsius temp reminded us a bit too much of our Minnesota and North Dakota heritage. We lasted long enough to take a few photos. Going on the sledding course was out of the question, as was the glacier walk of 1 1/2 hours roundtrip. We were at 11,333 feet above sea level. That is lower than the elevation we hiked to in Colorado last month, but a completely different climate. In Colorado, we peeled off layers. Here, I wished I’d had my puffy coat. Railway Station at the Top of Europe, inside the mountain. This was an unforgettable trip and we are glad we did it. Going early was a great strategy, at least with the weather forecast we had. We would be unlikely to go twice, so it truly was a once-in-a-lifetime experience. 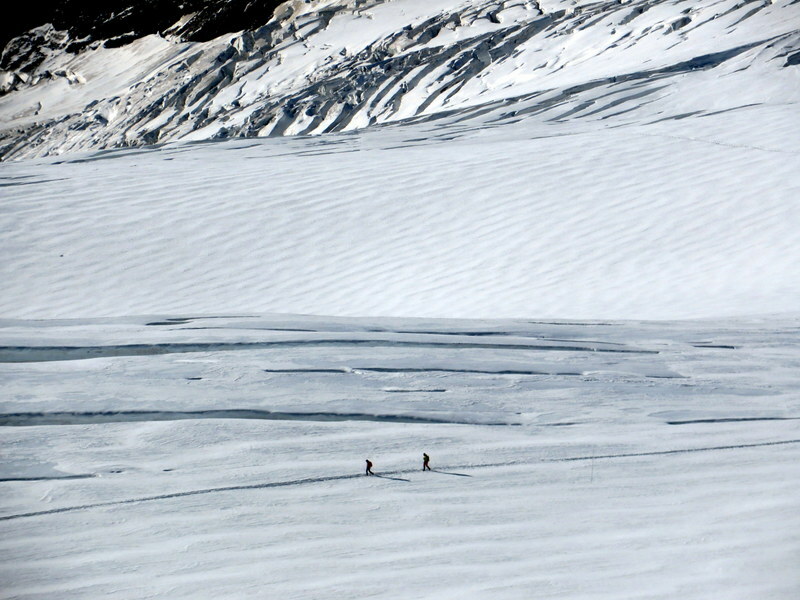 People walking on the glacier beneath the Jungfraujoch. 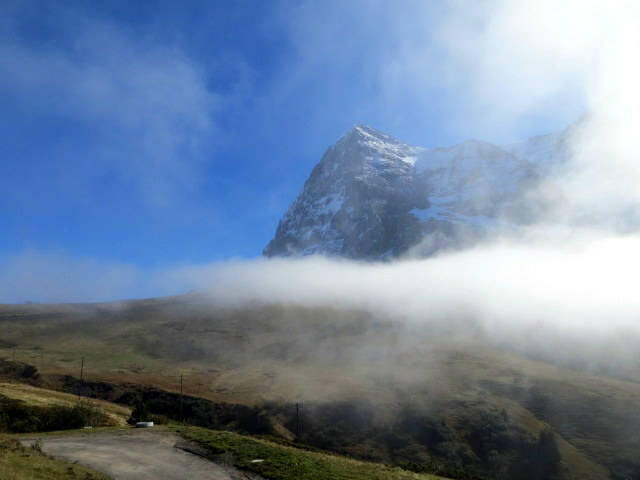 The Eiger pokes above low level clouds as we depart Kleine Scheidegg after our visit on high. 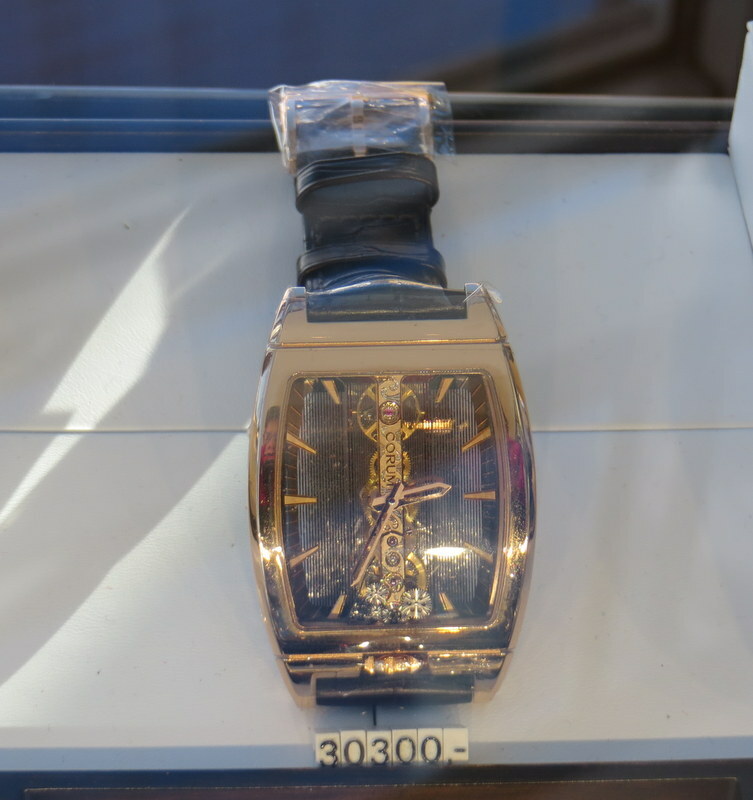 CHF 30,300 watch available at the highest watch shop in Europe. 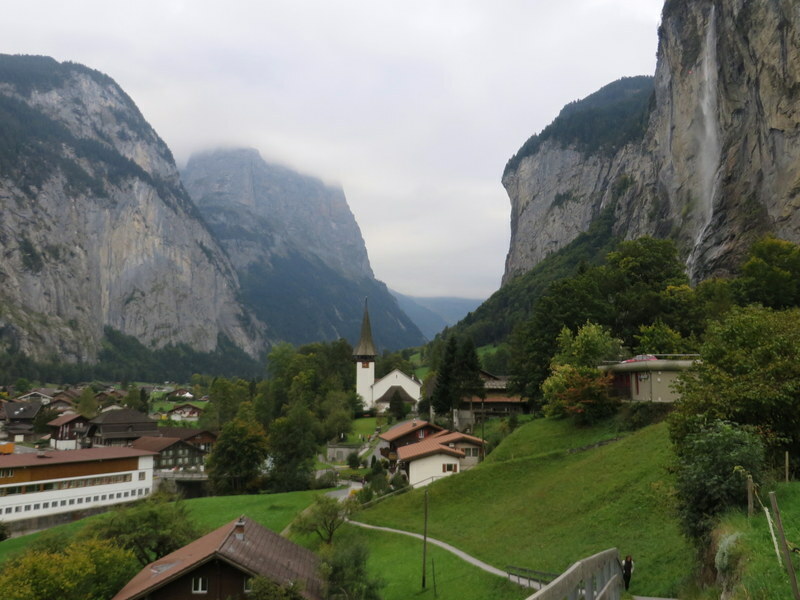 View of the Lauterbrunnen Valley. Our apartment is just a bit to the left of the church. View from our apartment. We can also see Staubbach Falls from our terrace.